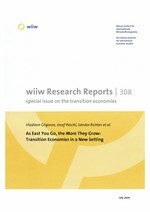 This wiiw report reviews the economic situation in the new EU member states, in the countries of Southeast Europe, in Belarus, Russia and Ukraine as well as in China. For each country, it provides a forecast relating to GDP growth, inflation, unemployment and current accounts in 2004 and 2005. The report is supplemented by an analysis of the challenges posed by European integration. The signs of a robust economic upswing in most countries of Central and Eastern Europe are overwhelming. Industrial output, construction, foreign trade and quarterly GDP figures confirm this development. The economic recovery in the 'old EU' (EU-15) has bolstered improvements in the business climate of Central and Eastern Europe. Moreover, in most of the countries in the region, economic growth has outstripped that in the EU-15; it is thus more in line with the comparatively positive growth figures recorded by the global economy as a whole. Central and Eastern Europe, together with Russia, Ukraine and China (the latter country has been included for the first time in our report), create every impression of having integrated fully into the global economy and added to its dynamics. That notwithstanding, if we disregard China, the other countries' contribution to global value-added is minimal. The major new feature is that (in addition to Cyprus and Malta) eight countries in Central and Eastern Europe joined the European Union on 1 May 2004: the so-called New Member States (NMS-8) - the Czech Republic, Estonia, Hungary, Latvia, Lithuania, Poland, Slovakia and Slovenia. A challenge to the enlarged Union's (EU-25) decision-making ability looms large. In the next two years the EU-25 will have to agree on a common financial perspective for the period 2007-2013. Enlargement has substantially widened income disparities within the EU; advancing towards cohesion has thus become a much more arduous undertaking. Enlargement of the euro zone poses another challenge. Of the NMS-8, only Estonia and Lithuania currently meet all the Maastricht convergence criteria. A brief study of foreign trade data reveals that in the Baltic States, foreign trade deficits are very high: for goods even more so than for services. The NMS in Central Europe have a much better track record in this respect - or at least, they have re established their good record by recently introducing a series of currency depreciations. In many respects, the South-East European countries awaiting EU membership are heterogeneous. Three of them, Bulgaria, Croatia and Romania, have acquired candidate status; their economies are characterized by relatively high growth. Economic recovery is also visible in West Balkan countries, in spite of political and structural problems. High growth in many of the low-income transition countries should not divert attention away from the shortcomings that still persist to a varying degree. Financial relations between the different types of economic agents are still unsound; the business infrastructure is not fully developed in terms of legislation, public administration and the judiciary system; high unemployment and the lack of social security are a seedbed for poverty, widespread petty crime and political instability. Finally, despite high GDP growth, structural distortions still characterize both Russia and Ukraine, whose economies continue to rely heavily on exports of crude oil as well as raw materials and semi-finished goods.